For the past 4 years Jean and I have been writing a book which started out as one thing and has turned into something different and very exciting. We are at the point now that we need your feedback in terms of the title. Click here to vote on whether or not you like our new title. (The subtitle is still being worked on). Suzanne Saxe-Roux, Ed.D. and Jean-Pierre Roux, Ph.D. Courage and Croissants is the story of one couple’s search for balance, and clarity in a hectic modern world. Reeling from the stress of life as a dual career couple with a young daughter, we decided to give up a life that was full of status but lacking in sanity. We left the housecleaner and gardener behind, along with our SUVs, moving instead to a small village in the South of France. We would take time to live simply, reassess, learn and grow as a family, be invigorated for the next phase of life and to create a foundation for a new American lifestyle that was worth living. 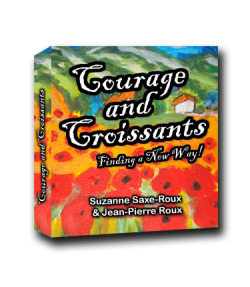 Courage and Croissants is the story and a guidebook of a mid-life couple who took the risk to go in search of what was truly important to them. At its heart is a love of family and the desire for a better quality of life. It is a story for anyone who has ever wondered—is there more to life? It's a story and a guidebook about healing, rejuvenation creating new dreams, embracing the simple joys of living, and focusing on what is important in life. Courage and Croissants is aimed at the over one hundred million career professionals between 40-60, in English speaking countries, who are thinking that life needs to shift—whether they need a break from the stresses of modern living, are nearing retirement, yearn for time with their family, or are just tired of the rat race. Not only does it take the reader on the journey of one family’s life transition, it provides guided tips, inspiration and education for those looking to make small and big changes in their lives. It is a narrative guidebook appealing to 40-60 year old career professionals who love to grow and learn, adventuress parents, pre-retirees, armchair travelers, and those who love to travel and experience a different side of life.